The Highline project was officially closed in March 2018. The Forest Service could no longer support the terms of our partnership and expressed no interest in renegotiating the understanding. We regret that we will not be able to complete the rebuild between Washington Park and Hatchery Trailheads. We are pleased that we have been able to improve the trail experience for over thirty miles of the Highline National Recreation Trail and linked trails. Special thanks to our financial supporters and to the volunteers who gave so many hours to this project. 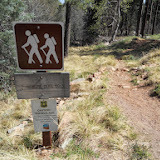 The Highline National Recreation Trail, so designated in 1978, is located north of Payson, Arizona and below the Mogollon Rim, which marks the edge of the Colorado Plateau in Arizona. 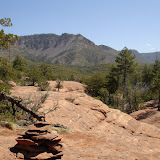 Over fifty miles long (the second longest NRT in Arizona), it follows a course below the rim between Pine Trailhead, off Highway 87, and the 260 Trailhead off of Highway 260. The original highline was constructed in the 1880's to connect ranches located below the Rim. This old route appears on topo maps and is evident in many locations today. More background information includes historical information and more about the trail and the area, funding recieived to support the work and plans for future work on the various parts of the trail. The statistics below cover only formally orgamnized volunteer events.Most of the work has been done by paid crew--at times accompanied by volunteers. Completed about 75% of the erosion containment structures and closed user created trail segments. A very congenial group including four children performed various tasks. The children worked at spreading brush to disguise/close an old trail access route. Using the excavator and some strong arms, several high-water crossing stones were replaced after having been washed out. The grade of the stream at the crossing was armored and leveled enough to reduce the force of the water flow at the crossing. Saturday, four volunteers gathered rolled barbed wire and T-posts and moved them to a location that will accessible by a quad for removal. Volunteers also cut loose another stretch of old fencing by cutting the clips holding the wire and pulling out the T-posts. The country sure looks prettier without fences! Sunday was devoted to hiking or biking. Two volunteers stayed at camp and rode the stretch of new trail. It had been freezing on Friday night and Paul had a bad cold, so we cancelled the work for Sunday, deciding not to camp Saturday night. 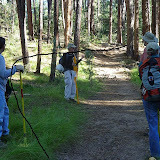 The three volunteers and Paul finished 800 feet of trail on Saturday. Two runners came by while we were working and waxed ecstatic about the improvements in the trail. They were training for the foot race in April. A crew seven, mostly female. 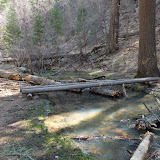 Performed maintenance and installed upgrades on 4,000 feet from the Zane Gray homestead area to the Tonto Creek crossing. Volunteers accomplished a variety of work, including closing and disguising old trail sections, obliterating many fire rings, building hardened drainage and adding guide stones to point out the continuation of the trail heading west. We camped at the pretty meadow of the old CCC camp. We hope to be able to use that camp site in the future again. Volunteers finished building 1200 feet of new trail, including a rock wall reinforcement. The new trail route had been prepared by machine. The finishing work included mucking out grass and some small roots. Crushed rock filler was used in some places where large rocks were removed leaving holes. On Sunday local volunteers brought their two charming sons and mascot Taco the dog. Five technicians from the Bridge Construction & Maintenance Division of VOAz completed this job in one day. The work entailed packing over 80 pounds of gear 3.5 miles in and back out from the Horton Creek TH. It was a tremendous day and we were treated to high water along the creek. Significant realignment was completed allowing the old trail in the rutted old road to be converted to a drain and revegetation work. Additional trail and drainage improvements made. Volunteers built 40 check dams along 750 feet of eroded trail and cut saplings and branches to place above the dams to catch silt and aid revegetation. Clumps of grass with the damp soil were added hoping they would take root. Eventually this section of trail will be closed when the realignment is ready. 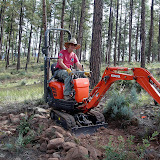 Before this event got underway, we spent two days with the STY240 trail machine building a dry crossing at Tonto Creek. The images below are from that week. On Saturday volunteers rehabilitated about 200 feet of existing trail immediately to the east of the Tonto Creek crossing. They also finished the first 50 feet of the realignment leaving Tonto Creek and created a stock ford at the crossing. All work was finished on Saturday. On Sunday remaining volunteers hiked/surveyed the loop from the Fish Hatchery trailhead through to the Horton Creek trailhead. Sections of the trail that have been worked by VOAz are very nice. The runners next week should enjoy the improvements. Volunteers rehabilitated the existing trail as a hikers' crossing for dry conditions or a stock ford. 50 feet of a new high water trail was built leading to stepping stones, which were placed across the wash.
Twelve VOAz volunteers hike the four miles from the Horton Creek TH up to the work site on a beautiful fall day. The bridge was completed except for setting four rebar anchors. Than was done about ten days later. Thanks to Janet for serving as EM and lunch maker. On Saturday 12 volunteers completed 300 feet of new trail and “reclaimed” 250 feet of old trail along Horton Creek. 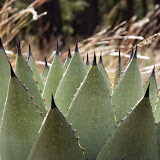 There were many hikers to contend with on this very popular trail. Most were happy to use the new trail, but some mistook the old, rocky jeep road for the ascending route. A cairn was added to alleviate confusion. One obstinate hiker descending the path pointedly refused to use the new trail after direct requests were made. On Sunday 9 remaining volunteers cleaned up the first section of the new Derrick Trail Head. 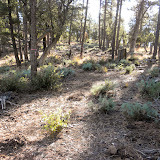 This work included removing several large juniper stumps happily growing in the middle of the tread. The official opening of the new trail was slated for that day. Dot and her able operator completed a mile of new rough tread, step, and drain work and is now 2 miles in from the trailhead. The 10 volunteers on Saturday and 7 on Sunday completed 700 feet of realigned trail and two magnificent switchbacks. Joe is a true rock master. Again Michael spent both days breaking new trail with the Compact Excavator. Marilyn provided dinner for us on Saturday night but was not able to stay overnight. Richard Anderson attended as crew-leader-in trailing along with Sue Thiebes, Joe Zweglich and Rick Kesselman. By Sunday they had us out numbered! The bears neglected us again. 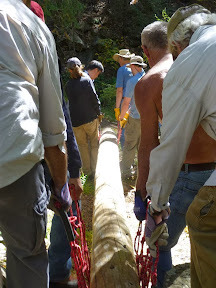 Although there were several one-day volunteers, we had 11 volunteers on each Saturday and Sunday completing 700 feet of new trail, 2 drainages and a switchback. Michael worked on breaking the new trail with the Compact Excavator. The campsite is right at the trailhead for Horton Creek. It is beautiful and has restrooms but no running water. Kathleen Tucker came to help the Event Manager with meal preparations. Some of the volunteers contributed dishes to the meal. We did not go hungry. There had been bears visiting the campsite a few weeks before the event, but no bears joined us for dinner. Some of the local people went home for dinner. 5 volunteers worked Thursday and Friday with a mini excavator to widen the trail tread and move extra large rocks before othe volunteers arriveds. Saturday and Sunday volunteers worked on nearly 3/4 mile of trail, including 7 realignments from 40 feet to 265 feet in length for a total of 890 feet and 2,960 feet of maintenance. Chelsea Muise worked with us along with two volunteers from the Friends of the Forest. The group of volunteers included two runner, Karsten Solheim and Deva Lingemann, who plan to run the Highline next week.